Regardless of the type of investing you are interested in, there is risk involved. You are basically making a bet that the future value of what you buy will be higher than what you pay for it. Buying gold is no exception. Fortunately, there are specific actions you can take to mitigate risks. Investing in gold requires a certain amount of knowledge. You want to know the different types of gold investments, the value of each, and what to expect from brokers. If you are new to buying gold, this research can take quite a bit of time. There are several ways you can invest in gold, including purchasing bars, coins, or shares in gold-mining companies. Each has its advantages and drawbacks. It is important that you understand your motive for buying gold. You can reduce risks by selecting an investment approach that allows you to obtain the benefits you seek. Bars and coins offer the best security because you can take physical possession of them. Stocks and gold-backed exchange-traded funds (ETFs) are riskier because of the volatility of financial markets. ​In addition to fact-finding, analysis is an essential component of any investment process. You want to know what is happening in the markets. The only way you will make money is by taking the time to learn about the precious-metals industry and financial markets. 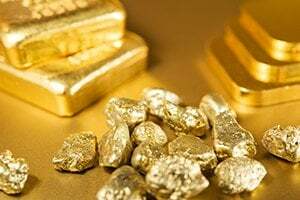 Once you have decided that buying gold is the right investment opportunity for you, find a reputable broker to work with that you can trust. When buying gold in its physical form, be sure to take delivery of it. Never allow purchased gold to be sent anywhere else but directly to you. Some sellers indicate that the gold you buy will be sent to a facility that has safeguards. This might be a scam that is designed to take money from customers. Buying gold does have risks. Do not work with any seller or broker that tries to downplay risks. Look for reputable dealers who are upfront about the various risks associated with this investment opportunity. Ask them to guarantee the authenticity of the gold they sell. The more you know about buying gold, the better able you are to minimize risks. Understand all of the costs associated with this investment opportunity before you ever make a purchase. Costs include insurance and secured off-site storage such as a safe-deposit box. As these costs increase, potential profits decrease.